Jeanne Ellis Ormrod is the author of several widely used textbooks, including Educational Psychology: Developing Learners; Essentials of Educational Psychology; Human Learning; Child Development and Education (with Teresa McDevitt); and Practical Research (with Paul Leedy). After many years of teaching and conducting research at the University of Northern Colorado, she now lives in New Hampshire. Eric M. Anderman is Professor of Educational Psychology and Chair of the Department of Educational Studies at The Ohio State University. His research focuses on academic motivation. He has co-authored and co-edited several books, including The International Guide to Student Achievement (with John Hattie); Classroom Motivation (with Lynley H. Anderman); and the third and current edition of The Handbook of Educational Psychology (with Lyn Corno). 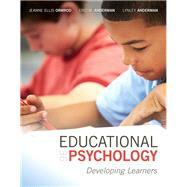 Lynley H. Anderman is Professor of Educational Psychology at The Ohio State University. A former classroom teacher, she conducts research on student motivation and interpersonal relationships in classroom contexts. A fellow of Division 15 of the American Psychological Association and former journal editor, she has co-authored the textbook Classroom Motivation and co-edited Psychology of Classroom Learning: An Encyclopedia with Eric Anderman.